Naxos has been a doughty champion of Maxwell Davies for many years, not only commissioning the series of Naxos quartets but reissuing old recordings and making new ones. Their latest offering is of works featuring the violin, mostly from recent years. A sonata for an unaccompanied solo instrument is one of the most demanding forms. Maxwell Davies had considerable experience with such works, having written solo works for various instruments, though he did not usually call them sonatas. Doing so for the solo violin sonata here immediately invites comparison with Bach’s works in this form. Indeed the work begins with a Bach-like chord before moving into what sounds at first quite like a sarabande. The work is meditative and exploratory, mostly slow and lyrical. Maxwell Davies has no difficulty spinning a long melodic line and I should say that this work, along with the others on the disc, is easy to listen to and does not challenge the listener with aggressive sonorities. The Dances from The Two Fiddlers is much the oldest work here. The Two Fiddlers is a chamber opera for young people which dates from 1978. That year the composer made an arrangement of the dances from it for violin and small ensemble and ten years later another one for violin and piano, which is what we hear here. Maxwell Davies liked dance music, of various different kinds, and wrote a fair amount of it himself. At the time of writing this work he had not long settled in Orkney and showed himself keen to engage with Scottish folk music. However, he does not draw on folk music here, but writes his own, in what I suppose he would have considered his popular style. He is well able to write proper tunes and clearly enjoyed doing so. The idea for the violin sonata was to represent an imagined journey through Rome, where he studied as a student and which continued to occupy his thoughts. The work is mercurial, with frequent changes of mood and pace. The violin line is predominantly lyrical, the piano percussive and the instruments do not share material. This sounds rather like Bartόk’s first violin sonata, and this does indeed provide a point of reference. Another is the Louange à l’Éternité de Jésus from Messiaen’s Quatuor pour la fin du temps which seems to be echoed in one passage. I should say that there is no question of pastiche: I am just trying to give some idea of what the work is like. I must admit that I did have some difficulty following the musical argument. Perhaps the idea of a journey makes it more like a tone poem than a sonata. A journey also lies behind the Piano Trio, with its subtitle A Voyage to Fair Isle. Fair Isle is a small island which lies between Orkney and Shetland in the North Sea; it has a population of about sixty people. Actually, this work is not about the journey but what Maxwell Davies found there when he visited it for the island's first music festival. He was delighted to find how the whole community had been engaged in the rehearsal and performance of a new work, not by himself, but by the Shetland composer Alasdair Stout. This is the most obviously beautiful of all the works here and features a folk song, on which the composer makes variations in his own way. The team here are all Italians, with whom Maxwell Davies worked closely. The lion’s share is taken by the violinist Duccio Ceccanti, who plays in all the works and for whom the solo sonata was written. His playing is technically immaculate and also very expressive: there is none of the cold objectivity which one can find with some performances of contemporary music. The two pianists provide fine support. A special word should go to the cellist Vittorio Ceccanti who plays only in the piano trio, but who is thoroughly familiar with the idiom from having previously recorded several of the composer’s works. These include the transcription for his own instrument of the Dances from the Two Fiddlers (review). The first three works are all listed as first recordings, this being the recorded debut of the Dances from the Two Fiddlers in this version. 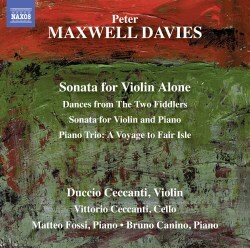 The version for violin with small ensemble was recorded on Unicorn-Kanchana DKP(CD)9070, a disc of Maxwell Davies’s music titled A Celebration of Scotland. The Piano Trio was recorded by its first performers, the Grieg Piano Trio, and was originally available as a download or custom CD from the original version of the website devoted to Maxwell Davies, Maxopus. The current version of that site does not offer this facility; it could also do with updating. There is also a new recoridng by the same trio on Champs Hill Record CHRCD090, coupled with two of Beethoven’s piano trios. The recordings were made over a period of several years in various Italian locations, but they sound well together in a suitable chamber acoustic. We should applaud and support Naxos’s continuing commitment to the composer and hope there will be more to come, as there are still many rewarding works which have not yet been recorded.